Worst machine I have ever owned. It is 2 years old & I am looking to buy a new one because I am so frustrated. It works, it washes our clothes but it takes hours sometimes and even then the loads come out soaking wet. Ask yourself why the machine has a cycle called "drain and spin". LEMON - please trust me, dont buy a GE Front loader you will regret it. search the internet & you will see lots of other comments just like mine. After experiencing the majority of problems others reported ( mold, no just spin cycle, out of balance constantly, abnormal long wash cycles) our Ge washer finally had the spider arm assembly disintegrate. If your washer starts to get extremely noisy and you find what looks like fine gravel in the discharge water or filter then its time to look for a new washer, don't waste your time with repairs or a repairman as Ge doesn't sell the spider arm alone and forces one to buy the tub and arm together at a cost of $500 as well as about 4 hours labour to take machine apart and put together again. I would go so far as refusing to take one of these machines for free just to save the headaches associated with it. This machine has been making the breaker jump ever since we've had it. The vibration is terrible but the last straw is the smoking. Ours is model WCVH6600HWW serial FM204424T and our home (Pulte) came with all GE appliances which have all broke. We figured they were 2nd grade builders specs but the washer and dryer we bought ourselves. I guess you know we won't be buying any more GE appliances. I am making sure I get my 401K out before it is affected by the shoddy workmanship allowed by GE now!!! I was having all of the draining / rinsing / spinning issues listed here. Then I cleaned the pump filter and now it works perfectly again. This video shows how to do it... it's super simple! We found 83 cents, a baby sock, a pen, a necklace, a bunch of sediment, and other junk two. It must be cleaned regularly... we discovered 8 years after we bought it! Thanks to comment on this blog, I fixed the problem of clothes still wet after spin. There is a filter behind the lower front panel--it was clogged with crud, coins, and other small items. Before complaining, check this out--I did not know it needs cleaning every year or two. GE front load washer shows units remaining in cycle - what do those numbers mean? The numbers apparently do not reflect minutes but I cannot figure out what the units are. It must be some approximations of time but it is allows much longer than the counter shows, so I am guessing the counter is some approximation of units remaining in the cycle. Also have had issues with a smell building up. the only way I have found to alleviate the smell is to rinse periodically with bleach and to keep the door open (don't EVER leave the door closed!). I am frustrated with this machine mainly because it will not spin the water out of the clothes - there is no way to set it to spin only. The machine is supposed to save water but because the only option is the rinse and spin it is using more water! If anyone can tell me how to force a spin only please let me know (shipper_2002@yahoo.com). I am looking for a new machine and like a previous post states I hate to unload this machine on some unsuspecting soul - even for FREE! THIS MACHINE IS HORRIBLE..... HAD 7 YEARS ALL SAME ISSUES AS EVERYONE ELSE, INCLUDING SMOKE! LUCKILY SOMEONE WAS HOME. GE NEEDS TO RECALL THIS MACHINE. I thought I was being environmentally friendly buying this front loader. I have had problems with the clothes not spinning dry no matter how many times I repeat the "Spin/Dry" cycle. It has been a nightmare these last two years with the fabric softener not draining into the wash and getting out of balance. The washer finally conked out on Dec 18 and 3 service calls later I still do not have a washer. It is now Jan. 12 and the parts either don't work or keep getting backordered and my service call keeps getting cancelled and rescheduled. I am going to buy a new washer tomorrow as I am so sick of this - almost 4 weeks with no washer and 3 kids! I am sorry I sold my 12 year old Maytags which were still working great. Not sure what brand I can trust anymore. Bought the extended warranty, used it once, should have demanded they actually fix everything wrong with it. It has always shaken the house like a helicopter taking off next door. Was told that's normal. BS!!! Now I know better. It just died as a result of shaking to death. The belt went, the pully and the bearings went as a result of shaking. Cost me $100 to get a repair gh to come over to tell me that it would be cheaper to buy a new one. Went out today and bought a Maytag set because I've seen. Y parents' set last 30+ years and would low to get even half of that. Will never buy another GE product again, ever. If you have this unit, dont ever leave it unattended. What a joke GE. My entire laundry room was filled with thick gray smoke... the load of wash smelled like a wet ashtray. Just horrible. I have been struggling with the moldy gasket for years, attempting to clean it with grout cleaner, and constantly have brown spots on my white towels... maddening. The smoke is the last straw.... gotta go and never looking back at GE again. Smoking like crazy during spin cycle. Huge fire hazard, thank goodness we were home when it happened. Total junk according to the service tech. No point in putting $900 in parts into this boat anchor. The smell in the washing basket is horrible. This machine needs to be recalled ASAP. It is probably causing health issues because I know it has to store mold. I bought this machine in January of 2008 and in 2010 I began experiencing non-stop problems. The machine now smokes and is super loud when it runs. I will never buy a GE product or a front loader again. 7 years old and just told that the inner and outer spindle needs to be replaced. It would cost $1400 to replace the parts which is more than I paid for the machine ($950). It sounded like a tornado was tearing through the house! I want my 18 year old machine back! It worked just fine when we decided to upgrade to the pretty new front loader. Clothes never get spun very dry and there is no "spin" cycle. You only can choose "rinse and spin". Save yourself the frustration and buy something else! I have to say that I love my machine!!! I have had it for 7 years and really had few problems with it. I have, however, been very careful to take really good care of it. I always make sure to wash my clothes at the right heat and if I'm worried about time I use the speed wash function which takes less than an hour usually. I try to use it infrequently since the point of the washer is to be as efficient as possible and it is not near as efficient with that function. 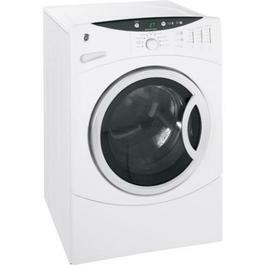 I have no trouble with the long cycles because I knew that was what I was getting when I bought the washer. You just have to know that the time given is just an estimation and that 1 minute left does not mean 1 minute less. The machine will continue spinning the load as long as it feels it needs to. My dryer takes a very short time to dry because the washing machine does such an efficient job at spinning out the water. We have had trouble with the machine not emptying (at aroun 2 yrs. I was terrified that all the horrible reviews I read were finally coming to pass for us. I called and paid for a service guy to come out. I watched him remove the front panel and empty the water out and find baby socks blocking the filter. He was super nice and give me the very helpful hint to put all small garments in a mesh garment bag for washing. He also recommended that I check the filter every 6 months to 1 year. That hasn't been a problem ever since. The last problem which I am currently experiencing after 7 years of use is the smell. Note - we have undergone 3 moves during the life of our washer and it wasn't until after the last move about 1.5 years ago that we began having the smell problem. In order to keep the smell down all we have had to do is to leave the washer open when not in use. (I also did cloth diapering which you might expect would make it stink, but it didn't.). The machine was apparently not fully dried out when it was packed and it sat in storage for 4 months. Needless to say it smelled when we got it out of storage and it has been a challenge to keep it smell free ever since. Tide packets help significantly as does leaving the door open, but with the way our laundry room is in this hone it gets shut a lot making the smell worse. I think a few new parts would fix the problem in addition to leaving the door open. I just wanted to give a good review because I have had a wonderful experience with this machine. All it takes is maintenance which is easily done yourself, leaving the washer door open when not in use, occasionally using a washing machine cleaner, and knowing beforehand that being efficient for this machine means it takes a long time for a load. I'm a stay at home mom and have no problem with the time. "Worst Washing Machine Ever" - I agree! Definitely the worst washing machine I've ever used. We gave away our last one that was over 15 years old because this nice new GE front loader came with our new house. I've disliked it since day one and now despise washing clothes because of the anticipation of having to face new problems with the washer. I've had all the same problems and may of the posts already on here and as sorry as I am that others are having problems, I am glad to know that I am not alone. The washer takes FOREVER to complete a cycle...I don't have 2 hours to wait around for my wash, the clothes come out water-logged and there is not a spin only cycle - just a rinse and spin, which would only add more water, I find clothes that seem like they weren't ever washed, and I, too, sometimes find the mysterious spots on my clothes. The washer smells moldy. I try washing it, drying it out with a towel, leaving the door open...nothing will take away the musty smell. I finally broke down and bought myself a new washer. Not that I want to dump this GE on anybody, but I'm going to put it up in Craigslist for FREE! This is the worst piece of crap appliance I've ever owned.. clothes do not get dry on spin cycle.. while on spin cycle the machine vibrates like an animal trying to get out. Yesterday we opened the door to see smoke coming from the drum. We were only washing a set of sheets. GE should be embarrased they made this product! Had it for 3.5 years. We had continued problems with it going out of balance. It also would tear some cloths and many times it would not wring out all the water. Last week it shot craps when the bearing went out. The bearing is pressed into the drum at the factory and if it goes out, you have to purchase the back half of the drum. The part costs over $400.00. It wasn't worth fixing so we bought a new (non GE) washer. i should of know not to get a washer that just goes around and around .. my white cloths never ever gets clean .. can always see where i washed my feet on the cloth . stell dirty in the middle of cloth ,no mather if i bleach , spray wash , or what.. I was so thrilled to have a front loading washer. I can honestly say now, I will NEVER own one again. This has been the worst washing machine I have ever owned. I would take back my old washer I had for 15 years! Clothes, towels, sheets, etc. sometimes come out soaking wet. The cycles take FOREVER to complete, this can't be saving us energy/water!! The mold on the rubber casing inside the washer is IMPOSSIBLE to get off. The running joke in my house when anyone is here and the washer is going is..."oh don't worry, that noise is just my washer" because it becomes imbalanced ALL the time and makes the worst noise! Grease type marks are left on clothes and when that happens, they NEVER come out. Many times I will wash things and it appears they never even came clean! Now, I am having problems with the washer leaking water during a wash. I don't know why GE has not recalled this washer! It is absolutely useless! I joke that I would give this machine away, cut my losses, and get a new one! Has anyone has recent success in getting GE to replace their washer? I agree with all comments on this machine it is a POS! Also bought extended service contract from store where purchased. They were in business 20 years then went belly up. Probably because of service calls on GE products. So much for the service contract. Now battling another service provider for $85 dollar service call. Tech said it needed one of 2 printed circuit boards but could not tell which one. I'd have to buy both and that were non returnable. What he think I was some sort of A-hole. Our trouble with our washing machine began in July...here it is Sept. 23 and the serviceman came out for the 3rd time today, with 2 new replacement parts...AND now the control panel is bad and has to be replaced, so another week or two without a clothes washer!!!! When our problems first started acting up it just hummed when started, and did nothing. One problem has lead to another, and oh I might add it also leaks water...large amounts!! We bought the extended warrenty, but are told that a part has to be replaced 3 times, whereas in our case one defective part has lead to another. I think it is asking a lot of a customer to go without a washer for 2 whole months...I am disappointed with GE, and I wish we didn't own this machine. I purchased this machine in 2006 with an extended warranty. The machine is awful.The white clothes have brown spots. It smells of mold. After 10 service calls, the machine still does not clean the clothes. Please don't buy this machine.I wrote a letter to customer service along with pictures of the dirty clothes. They sent out another service person who was useless. I hate it!! The soap dispenser turns black with mold have to take a tooth brush to clean it (which still doesn't get everything) then run a load of bleach and this is at least once a month..Then to top that off the water pump drain that can only be acceded by taking the front of the washer off has to be drained after every load or the old stale water gets recirculated through the next wash..ALL YOUR CLOTH SMELL LIKE MOLD UNLESS YOU DO THIS EVERY TIME!!! GE has been really less than helpful. DO NOT BUY!!! I wrote the first comment here. Afterwards I contacted GE to tell them how disappointed I was with the product. They bought it back from me & paid 70% of my purchase price. It was surprisingly easy. In Canada they are called, MABE. Good luck! I have never owned such a terrible washing machine!Our clothing does not come out clean.I actually have to wash each load two times with an extra rinse or our clothes would be full of detergent. Also this machine is out of balance on average of three times per week-I am shopping for a new machine-This time it will not be a General Electric.Please save yourself the frustration and steer clear! I agree it seem every year it cost me over $300 to fix something. Truly the worst machine I have ever owned. This was the most poorly designed front load washer we have ever experienced. We had our original washer replaced with another of the same model resulting in the same old stability problems. It washes beautifully but can't handle load distribution and certainly has trouble spinning the water out. The interior stainless steel drum can be shaken by hand, it is so loose. No wonder it won't spin... I haven't been able to wash towels or sheets or heavy cotton sweaters. Fortunately GE is refunding us and we're replacing it with another brand. Maybe this will be the end of our laundry purgatory...? I will never buy another GE product after owning the GE Frontload WCVH6260 Washer. The only shining moment of owning this machine was when GE recalled some 180,000 front load washers recently (2010). Unfortunately mine was not one of them. I did not buy the extended warranty because I thought if you pay $1000 for a washer it would last more than 2 1/2 years. First year everything ran like a dream, then 1 yr 2 months in it crapped out, very convenient considering the factory warranty is only good for 1 yr. The first item to go was the control board setting me back $275 plus the $75 service fee, then 8 months later the dispenser motor, another $250 plus the $75 service fee. At least I have lifetime warranties on all of those parts now. Just last week it stop working again, I ran the error codes and it say E39 (Dispenser Error). The technician came out and said it was a wiring problem now, he fiddled with the wires and got it to work again. One load later it is not working again. 3 services call in a two week span is a lot when you have to take a half a day off every time it needs to get fixed.